Software migration is a lengthy process that sees hundreds of modules move from an obsolete framework to a much more preferable one. However, there are a number of pitfalls in a large porting effort that can significantly increase time, cost, and complexity, leading to risk of project derailment. Regardless of what your current system was built with, moving the user interface portion can be one of your most difficult tasks. You may have languages, frameworks, and windowing systems that are no longer supported or that you are unable to find developers for. What’s more, legacy UIs tend to look very dated compared to today’s fluid animations, context-sensitive controls, and responsive interactions, requiring more than just a simple port to bring them up to date. 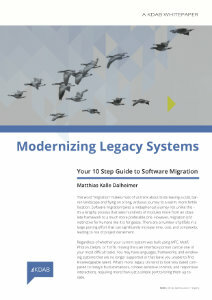 This whitepaper is a detailed guide to help you effectively evaluate whether a migration makes sense for your current system, and to help you outline and execute your own.